Dentures are removable, artificial replacements for missing teeth, to maintain oral form, restore function, appearance and health. For those who have lost some teeth, but don’t want to get dental implants or bridges, partial dentures are an affordable option. Partial denture can be made out of full acrylic or incorporated with cast metal framework. 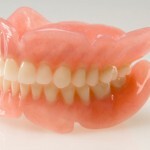 Acrylic partial dentures are more affordable partial dentures. Cast metal partial dentures are usually greater in cost due to laboratory procedure for metal framework. You have to wear your new denture immediately after extractions and need to visit your dentist 24 hours after extraction done. However, you need to be followed up regularly by your cosmetic dentist to monitor healing and made some adjustments to fit properly during healing process. You will typically need a new set in about six months since bones and gums shrink over time and change the fit of dentures. Overdenture is a removable denture which is constructed covering the teeth or roots or dental implants. The cost of dentures can vary considerably, depending on the type of dentures selected, the prosthodontist involved, and the area of the country in which the procedure is performed. Discomfort for the first denture wearer is a common occurrence. Initially dentures often will feel strange and bulky, and will cause a temporary feeling of fullness in the mouth of the lips and cheeks, loose for a few weeks due to difficulty in muscle control, gag reflex, minor irritation or soreness to occur and hypersalivation since new dentures are interpreted as foreign objects by the oral system. These symptoms usually disappear over time as your mouth adjusts to the new denture. Speaking normally with new dentures requires practice. You may read aloud at home since speech with reading practice quickly assumes natural tone and fluency. Learning to chew with new dentures takes time. You should restrict yourself to soft diet and avoid tough, fibrous food. Chew on both sides of your mouth at the same time to stabilize your teeth. Lower denture tends to loose easily due to lack of retention and support. Try resting your tongue against the back of the front of the lower denture to help hold it in place. Until you learn good tongue and lip control, it may be wise to use denture adhesives to help hold your lower denture in place. If your denture breaks, visit your dentist for denture repair. Dentures can break easily, so always fill the sink with water, and then clean your dentures over the sink, under gentle cold running water just in case they slip out of your hands by accident. Do not wear dentures at night especially during sleep in order to promote better long term health of your gums. Soak denture in warm water or a denture cleanser (such as Fixodent and Polident). What are the alternatives to permanent dentures? For those who want more stable and comfortable denture alternatives, dental implants and dental bridges may be an option. The cost is usually greater than dentures, but the implants and bridges more closely resemble the feel of real teeth. A dental implant is an artificial tooth root used to replace natural tooth, attached to the jaw by means of metal studs implanted permanently into the bone. Dental implants are more esthetic, comfortable and tooth-saving. Pricing depends on the type of dental implants and the materials used, the experience of the dentist installing the dental implants, the region of the country in which the procedure takes place and the cost of living there, and the amount of preparation work required before the dental implants can be put in. Under proper conditions, and good patient maintenance, implants can last a lifetime. Dental bridges involve creating crowns for the tooth or implant on either side of the missing tooth, with a pontic (false teeth) in between or may attach to adjacent natural teeth with metal and plastic connectors to replace one or more teeth. Bridges require you to maintain good oral hygiene, but will last as many ten years or more. Your dentist can help you decide if either of these denture alternatives is better suited to your individual needs. This entry was posted in Denture Cares, Oral Care and tagged complete dentures, cost of dentures, dental bridges, dental implants, denture cleanser, immediate denture, lower dentures, partial denture, permanent dentures, sore gums, upper dentures on August 16, 2009 by Mian.